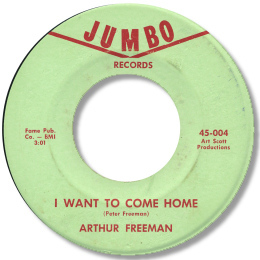 Florida native Arthur Freeman isn’t the same artist as Art Freeman who cut those couple of cracking 45s for Fame in the 60s. But Arthur did cut the brilliant deep classic I Want To Come Home in Muscle Shoals so the confusion is understandable. 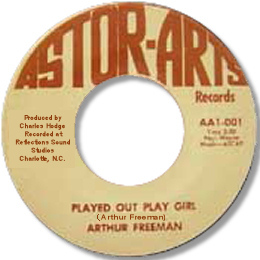 Freeman’s first release for the tiny Regal label from Ft Pierce, FL must have been cut around the turn of the 60s judging by the doo-wop influence to both the easy midpaced “Played Out Play Girl” and the ballad “I Can’t Understand”. But both showed what a fine high baritone voice he had. The Dade 45 was far too poppy to be of interest here, but his next 45 certainly is. I Want To Come Home is absolutely first class. Over a subdued organ (Spooner Oldham? ), Freeman is totally convincing as he pleads for a second chance, and the horn charts add just the right touch to this classic 6/8 deep gem from the mid 60s. This will cost big money as the flip is a heavily sought after Northern side - and the most polite way of describing my views on this is to say that it hasn’t made its way onto my Ipod – despite having 60BGs of space on it! Another “Tear Stained Face” it certainly isn’t. Reflection Sound Studio boss Wayne Jernigan cut him in 1971 on the lively “Played Out Play Girl” and Freeman’s screaming vocals brought a great sense of urgency to the recording. For once a recut sounded better than the original. The slow blues “Here I Am” features another good vocal but Reflection were still having outlet problems at this time and Jernigan had to persuade the owner of a local cinema which specialised in x-rated movies to put the money up for a new label even to get the disc on the streets. And the result, Astor-Arts 101, is now a real collector’s item. But the strength of the 45 allowed it to be leased out to Excello later that year, a good home for a throwback southern sound like this.